I finally did it: I'm a dad. The funny thing is, I've always owned dad cars, even before I needed to. Owning anything with less than four doors never made much sense, which is how I ended up with a stable of souped-up grandpa cars from the Sixties and Seventies. Now that I'm a father, the '74 Oldsmobile sedan I brought my wife and son home from the hospital in seems a bit dated. And that, my friends, is how I found myself on this quest to find the perfect new dad car. The latest contender: the 2019 Ford Fusion Energi plug-in hybrid. Random dad fact: If you have to put luggage inside your car—which you will in a Fusion Energi—it's a good idea to strap it down. Flying luggage can kill. I laughed out loud when I opened the trunk. It wasn't a good laugh, like when you'd chuckle at a standup comedy bit on Netflix. It was a sardonic one, aimed at a different sort of joke: the Ford Fusion Energi's trunk. This, I thought, would never work for a parent...or even for anyone who might want to carry a full-size suitcase to the airport at some point. In general, the Fusion is a handsome, if somewhat conservative, car. The second-generation version hit the North American market for the 2013 model year, but its crisp lines and attractive proportions have aged well. Like all sedans in Ford's lineup, though, the Fusion is living on borrowed time, as the Blue Oval will shift its focus almost exclusively toward strong-selling trucks and crossovers in coming years. That's probably why the plug-in hybrid version of the Fusion, which was introduced with the 2013 lineup, feels like something of an afterthought. Instead of designing a car that could function on its own as a plug-in hybrid, Ford simply crammed a bunch of batteries into the trunk of a small sedan and called it a day. I wish I could say the sum of the Fusion's parts makes up for that glaring flaw, but I cannot. 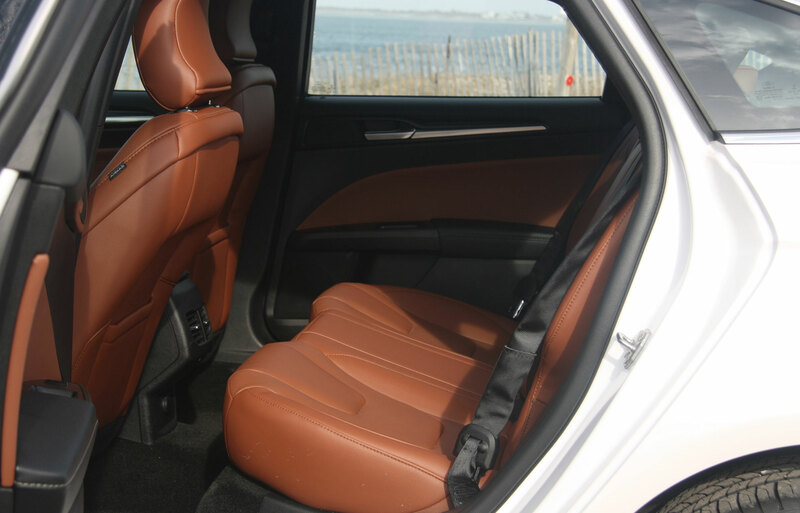 The interior is nice; fit and finish are good, the seats are comfortable, and the ride is quiet. The Fusion also has a decent-sized back seat and plenty of leg and shoulder room. If I were to stop my evaluation of the Fusion there, I'd say it has everything a sedan should have. But then my eyes migrate from the instrument cluster down to the center stack, which appears to date back to the second Bush administration. The LATCH anchors are easy to use, and it's easy enough to fit a child safety seat through the back doors and into the rear seat. Once you have that piece of kid gear nailed down, you start thinking about throwing the stroller in the trunk...only to discover there is no trunk. Well, there is one, but fully half of it is filled with batteries, leaving behind only 8.2 cubic feet of space. You can definitely fit an umbrella stroller in there, and maybe two or three bags of groceries. But a full load of food is unlikely to fit, and a medium-sized stroller like the City Mini definitely won't fit. Neither will the travel crib, a full-size suitcase, or any of the mountain of crap you'd need for a weekend trip in this car. 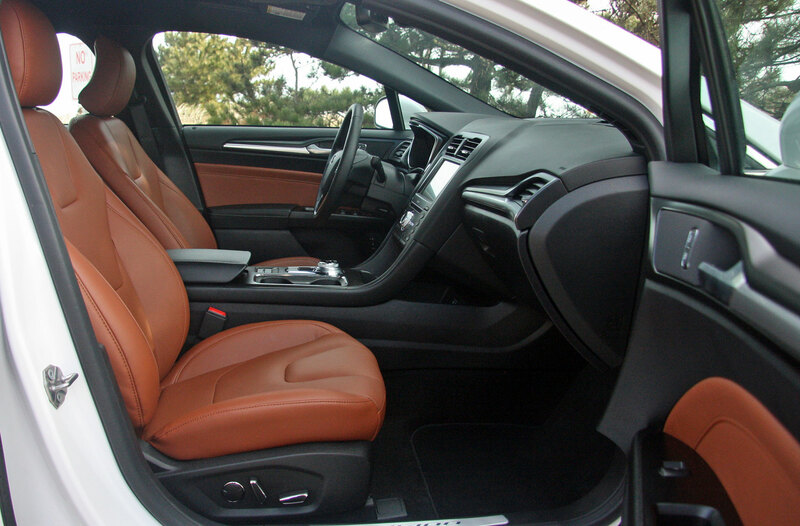 As an added insult, the rear seats fold down for the pass-through that's included in the conventional Fusion sedan. But in the plug-in hybrid, all that remains of the pass-through is a 1-inch sliver, so that you can peer into the trunk you cannot actually use. Since the Fusion Energi is basically a normal small car with a bunch of batteries stuffed into its trunk, it feels a bit sluggish. That's probably because the car's gas-electric hybrid puts out only 129 pound-feet of torque in a car that weighs nearly 4,000 pounds. Car and Driver says it will hit 60 mph in eight seconds—by no means neck-snapping, but quick enough to get you to speed on the highway. Despite its weight, the Fusion Energi handled well and gave a smooth ride. Perhaps because of all the weight in the trunk, it felt well-balanced—and perhaps despite all the weight in the trunk, body roll wasn't overly pronounced in tight turns. When you have a little one in the back, smooth is good. It means there's less chance your kid will be disturbed from any deep slumber he or she may be fortunate enough to enjoy. Although the EPA's claimed electric-only range for the 2019 Fusion Energi is 26 miles, I managed to squeeze just over 22 miles out of EV mode in a mostly-highway commute-plus-errands trip. The Insurance Institute for Highway Safety (IIHS) gave the Fusion—but not the Energi specifically—top marks in its crash tests, as well as a good grade for its crash avoidance technology. The headlights got a "Poor" rating from IIHS, though. For some reason, the federal government didn't rate the Fusion Energi in most categories, although the car did score 4 out of 5 stars in the rollover test. The gasoline and conventional hybrid models of the Fusion received a five-star crash safety rating overall from the feds. This is the first new dad review I've done which resulted in an automatic disqualification. I wish there was more to say, but for the typical family, dropping this much money on something that has a smaller trunk than most sports cars just doesn't make any sense. For parents—and for most people, really—the need for cargo space is unequivocal. For what you get—car-level seating with golf cart-level luggage capacity—a price closing in on $40,000 is a big ask. For that price, you can get a plug-in hybrid Chrysler minivan, which, for any family who can afford it and find space to park it, is the tip-top in capacious conveyances. And if you really must have a plug-in that's smaller and easier to park, the Chevrolet Volt is cheaper, has a fully-functional hatchback setup, and will go more than 50 miles in pure electric mode. It has its drawbacks, but the point is, there are better options out there than the Fusion Energi.